Two men driven to tell the truth ... whatever the cost. Experience the celebrated film The Insider on Blu-Ray for the first time with an all-new digital restoration ... Nominated for 7 Academy Awards, including best picture, best director, and best actor, this gripping true-life drama features an astonishing cast, including Oscar-winners Al Pacino, Russell Crowe and Christopher Plummer. Witness the incredible chain of events that pitted an ordinary man against the tobacco industry and dragged two people into the fight of their lives. When former tobacco executive Dr. Jeffrey Wigand agrees to blow the whistle on the alleged unethical practices within the industry, and forms an alliance with veteran 60 Minutes producer Lowell Bergman, he starts an all-out war that could cost both men their reputations.and much, much more. Relive every unbelievable twist and turn like never before on Blu-Ray. $6.712 million on 1809 screens. It’s too bad 1999’s The Insider fared poorly during its theatrical run because it's really a fairly compelling film. Scientist Jeffrey Wigand (Russell Crowe) loses his job at a major tobacco company. When approached by 60 Minutes producer Lowell Bergman (Al Pacino) to help “translate” some documents, Wigand eventually finds himself willing to spill the beans about what “Big Tobacco” CEOs really know about the negative effects of their product. We follow these endeavors and how they affect Wigand’s life. On the surface the subject seems so obvious as to be useless. I mean, it's not like many folks really don't know that cigarettes are bad for you, despite the absurd claims to the contrary made by the Big Tobacco companies. No one expects any shocking revelations to come from information; in fact, the only value attached to Wigand's stemmed from the fact it was one of the few times a company "insider" admitted these issues, which obviously paved the way to many lawsuits. Although The Insider comes saddled with a predictable plot - very little happens that can't be viewed a mile away - it remains interesting just because it's so well-executed. Director Michael Mann knows his way around a thriller and can turn banal material into fairly exciting stuff. The film lacks any kind of real “action”, which makes it a departure from Mann’s other work like Heat or Last of the Mohicans, but it still feels like an action movie because of the aggressive way in which Mann directs it. He moves things along at a strong clip and keeps the viewer attentive and absorbed at almost all points; I only lost interest when we saw the (very few) indications of Bergman's home life. The acting seems uniformly positive. Crowe received a well-deserved Oscar nomination for his portrayal of Wigand, who he gives a corporate lifer's exterior by gaining weight and dyeing his hair gray but provides a strength of conviction that make Wigand's actions believable. Pacino doesn't stray far from his usual blustery self but at least he tones down the theatrics more than usual. I think he got stuck in that hammy …And Justice for All "you're out of order!!!" mode for so long that he barely remembered what it was like not to scream most of his lines. Pacino's work here doesn't approach the heights he hit back in his Godfather days but he nonetheless seems more subtle and nuanced than usual. The Insider isn't a great film, but it's a surprisingly provocative and compelling one. I've never been a huge fan of Michael Mann, but his work here establishes that he can create a charged story without guns or battles, and the end result is a powerful and entertaining effort. The Insider appears in an aspect ratio of approximately 2.39:1 on this Blu-Ray Disc. I felt consistently pleased with this excellent presentation. Sharpness looked terrific. Only the slightest smidgen of softness ever occurred, as this almost always provided a concise, accurate picture. Jagged edges and edge haloes weren’t an issue, and I saw just a tiny bit of shimmering on one occasion. Print flaws failed to manifest themselves in this clean image. In terms of colors, the movie often opted for stylized elements. Chilly blues appeared much of the time, and I also saw scenes with amber or green overtones. Within the film’s design choices, the hues looked well-developed. Blacks were dense and deep, and I thought shadows displayed nice clarity; the flick went with a high-contrast look much of the time, but it still gave us smooth low-light shots. The image has held up very well and looked simply outstanding. While not as impressive, the film’s DTS-HD MA 5.1 soundtrack was more than competent for a tale of this sort. The soundstage maintained a forward bias, so the front speakers dominated the proceedings. That meant it emphasized the center - this was a dialogue-intensive film - but it can spread nicely to the sides when necessary. The surrounds provide mainly ambient information such as mild effects or some gentle echoing of the score, though they could open up at times. Street scenes or those at restaurants and airports allowed the settings to broaden, and thunder echoed well around the room. Nothing here could be called immersive, but the mix added the right flavor of ambience. Audio quality appeared strong throughout the movie. As I mentioned, dialogue dominated, and it sounded good, with clear, natural and easily intelligible speech apparent at all times. Effects seemed accurate and realistic, and the score displayed good dynamic range and clarity, with solid low end as well. 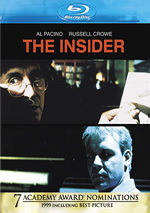 Ultimately, The Insider featured a modest but effective soundtrack. How does the Blu-ray compare to the the original DVD from 2000? Audio was a bit broader and richer, but the visuals showed the most obvious gains, as the Blu-ray was significantly better defined and smoother. Only one notable extra appears here: a Production Featurette. It goes for seven minutes, five seconds and provides comments from director/co-writer/producer Michael Mann, former tobacco company executive Jeffrey Wigand, former 60 Minutes producer Lowell Bergman, attorney Richard Scruggs, Mississippi Attorney General Michael Moore, and actors Al Pacino, Russell Crowe, and Christopher Plummer. We get notes about story/characters and the facts behind the film, sets and locations. It delivers a few interesting notes but it’s mostly a superficial promotional piece. The disc opens with ads for Red Widow and Who Framed Roger Rabbit. These also pop up under Sneak Peeks along with a clip for Revenge. We get the trailer for Insider as well. The Insider comes to us with a compelling story that's very well-executed. This piece easily could degenerate into TV movie territory, but the excellent cast and assured direction of Michael Mann make certain that doesn't happen. The Blu-ray delivers top-notch visuals and good audio but skimps on supplements. It’s too bad the flick still lacks notable extras, but the Blu-ray presents it very well.